I don't think the pictures do this justice - it's difficult to photograph black LEGO bricks in such a way that you can actually see the structure. I usually end up playing around with the brighness and contrast and trying not to wash everything out in the process. In any case, this sculpture may not look like much but it was Very Hard. As you see, though, I did make the rock a different colour from the thinker, in order to show up the shape a little more clearly. It would be interesting to see how much better a rendition could be achieved using slopes, but I don't think I'm going to try this in the near future (or probably ever). The other, rather serious, constraint was size. The sculpture is less than 40 bricks tall. This is just small enough to make it hard to render the detail convincingly. For instance, it would be very hard to try to render the face without using slopes or other non-rectangular bricks - though it does convey the general impression of the nose and the ridge of hair running round the head. I think the feet are fairly successful, and his right hand has the right number of fingers, which is about as much as you can expect at this scale. 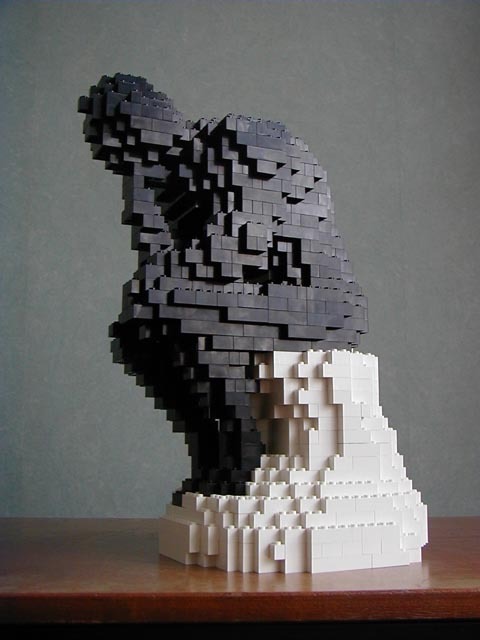 Although I built my LEGO Dilbert character sculptures entirely by eye from books of comic strips, I did not attempt this with the Thinker. The first cut was generated by using photographs of a small rendition of Rodin's work, taken from various angles, which I found on the web. I hand-hacked the photographs into sillouettes, and wrote some C code (actually loosely adapted from the programs I used to produce my mathematical LEGO sculptures) to use the sillouettes to cut away at a notional block of 1x1x1 LEGO bricks and produce a .DAT file for what was left (With more than two photographs, taken from unspecified angles, this is a bit fiddlier than it sounds). The result was pretty grotty around the legs, so I hand-hacked the photographs some more to remove the rock , and produce sillouettes (and hence a .DAT file) of just the figure. Then I laboriously removed the figure from the pictures and ran my code again to produce a .DAT file of the rock (no, you can't have them; they look terrible). The result was still pretty rough around the legs, and awful around the front of the torso and the arms, but I edited fairly broadly by eye as I built the first version. Then I built a second one from the first, editing by eye again. After a third pass, and a week after seriously starting the project (I've been vaguely thinking about it for months) I finally produced the sculpture in the pictures. I'm still not completely happy - the legs are a bit too bulky, and the left arm needs more work - but I don't think I'll be making further alterations unless I disassemble it to produce a .DAT file of the final construction.